CHASING FOOD DREAMS: Xin Cuisine, Concorde Hotel Kuala Lumpur: Prosperity and Abundance Blooms at Xin! Xin Cuisine, Concorde Hotel Kuala Lumpur: Prosperity and Abundance Blooms at Xin! More Chinese New Year Menus! A first visit for me, I was immediately drawn to its grandeur upon the entrance of Xin Cuisine, Concorde Hotel Kuala Lumpur. All decked out in auspicious gold, cream and dark wood, one just cannot help but stood at awed in the grandness of the restaurant coupled with two huge pillars coiled with gold dragons! Red lanterns crown the center to provide shots of brightness to the whole ambience. The evening kicked off with its gorgeous gold and red table setting playing host to the auspicious Yee Sang. Xin Cuisine, a 360 seating capacity, serves nouvelle Cantonese cuisine and Hong Kong dim sums. It also boasts a noodle bar serving various noodle and rice dishes to please even the discerning taste buds. 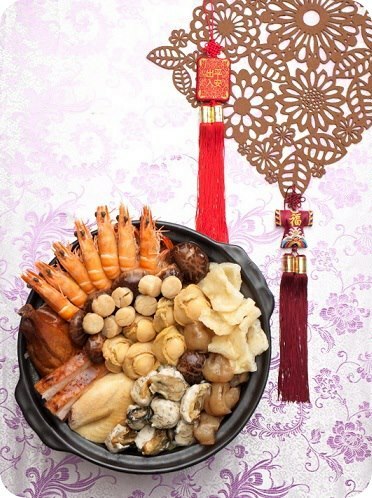 This festive CNY season, Xin Cuisine New Year offerings arrive in abundance with a sumptuous variety of traditional and new Yee Sangs, Prosperity menus, Waxed Meats, Nian Gao and dim sums. We were treated to a little bit of everything that evening with the gracious presence of the Concorde Hotel Kuala Lumpur team. The customary dish shone brightly with chewy baby octopus, jelly fish and the usual condiments with the addition of seaweed crackers. The seaweed crackers added a unique oceanic flavor to the yee sang. The yee sang hit a moreish and sour note here and plus points goes to the no oil concept and lots of crushed peanuts and sesame seeds for aroma. Lo Hei! Lo Hei! Little bouncy bundles of fish maw wrapped with seafood paste and oyster summed up the dim sum. I love it for its texture, flavor and delicate touch. It has a natural sweetness of the sea with the dried seafood and the seafood paste. I would certainly love to enjoy a few of these succulent bundles! Ok, no alien life-form detected here. Instead one gets a resplendent quail egg beneath the thin pastry skin together with prawns and other sea treasures. I doubt anyone would not like quail egg as the richly flavored egg seemed to win the hearts of many most of the time with its presence. Nestled beneath is lightly sautéed spinach for some green touch. My favorite dim sum of the lot, its slight chewy texture of the abalone with bits of sea cucumber and bouncy filling take the cake in flavors. Doused with aromatic brown gravy, I just love the taste that filled my senses with pleasure. Simply a must-have! Deemed Salted Egg Puff by staff, this Woo Kok look-a-like exemplifies the textures of powdery yam filled with a tasty savory filling. Its light crisp fluffy texture seemed to please many that night. A light hint of salted egg yolk makes the dim sum a creamy dreamy one! Bold and red, the sea garoupa truly illustrated the auspicious ‘Nian Nian You Yue’ beautifully. Going traditional, the fish was sweet, flaky and very delicate with the soft notes of soy sauce. In a way, I am very glad for this classic to savor the full beauty of the sweet garoupa. I knew I was going to enjoy this dish when I saw it. Fish paste with black Fatt Choy is neatly molded with oyster to circle a medley of broccoli and layered bean curd. Each bite is filled with deep rich notes of the oyster while the fish paste is delectably moreish. The sauce is very light in sweet and savory notes. Another traditional favorite, the fluffy fried rice was filled with lots of wok heat and aromatic waxed sausages. Boldly using two types of Chinese sausage and Wine sausage, the combination worked its magic into our taste bud heavenly. Unduly sweet, the flavors pumped up the fried rice with bits of sweet corn kernel gorgeously. There is a reason why this traditional dish is a favorite! Desserts were superlative in creativity! Not one but three unique twist on the traditional Nian Gao has put the dish to be one of the most creative inspired Nian Gao this season. Showcasing Sweet Potato Nian Gao with Macadamia Nuts, Pineapple Paste & Almond Nian Gao and Durian Paste Nian Gao, I can smell this dessert a mile away because of the king of fruit, durian. Though it was pure agony for me to face my nemesis, the durian, I braved the smell and tasted the other two. I loved both Sweet Potato Nian Gao with Macadamia Nuts and Pineapple Paste & Almond Nian Gao equally. Sweet potato was creamy and sweet with a soft and nutty texture while the pineapple paste seemed to work deliciously with the Nian Gao and crushed almond bits. I only managed to take in the raved reviews from others for the durian one as they said the real McCoy was distinctively present in the durian Nian Gao. I have always only had it in chilled jelly square but the version here has managed to outdo the classic version. Soft wobbly almost liquidly jelly is tainted with the familiar hint of light bitter edges of the osmanthus flowers and sweet niblets of wolfberries. The dessert evoked cooling sensation to the tongue while soothing our senses after that glorious meal. Chef Wong Pak Seng, Chef Ng Meng Loong and the new kid on the block, Chef Lok Meng Pak present an irresistible authentic CNY menu appropriate to usher the arrival of New Year of the Water Snake. Borrowing a line from someone I know… my verdict of Xin Cuisine was Totally Smitten! Enjoy feasting this spring season and witness fascinating acrobatic acts and lion dance performances by defending world champion, Kun Seng Keng lion dance troupe. More excitement to follow with action-packed show by acrobats, yee sang toss where guests can also join in the fun and special appearance by God of Prosperity (Choy San Yeh). *Xin Cuisine is closed on the first day of Chinese New Year. My favourite dim sum place! Bet the food is awesome. Looks good. What’s up, every time i used to check blog posts here in the early hours in the break of day, for the reason that i enjoy to gain knowledge of more and more. I want the best ways to get a deal on India Hotels. Chinese Food RestaurantThanks for another informative site. Where else could I get that type of information written in such an ideal way like this post.This post is really nice one.